Surf! Finally. 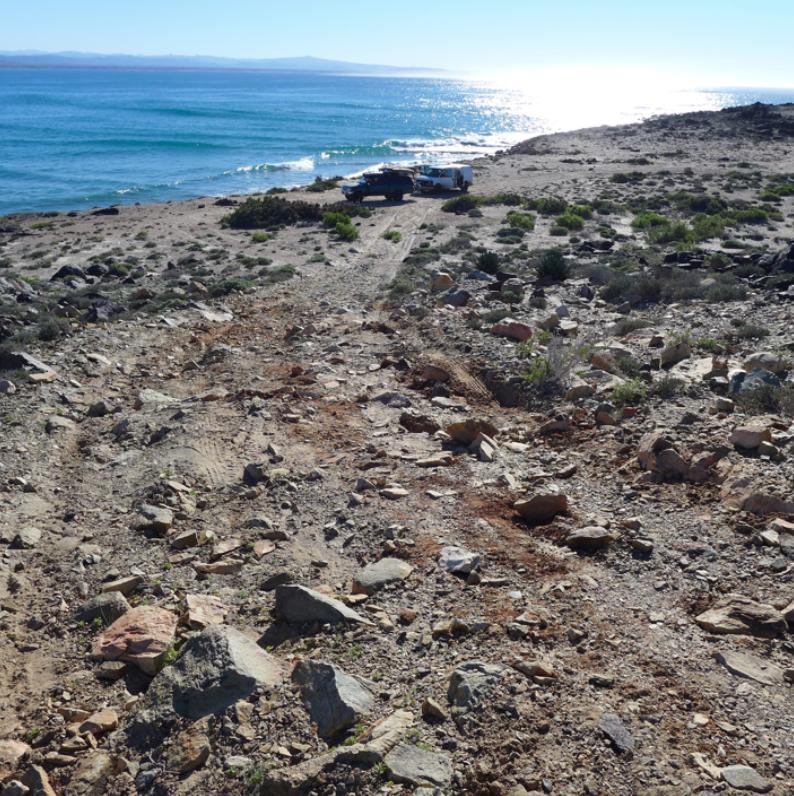 After creeping through the beautiful, yet tortuous Baja 4x4 track we popped out into a clearing right next to the paved Baja highway. I hooked up CON KSO's CO2 air up system and blasted some carbon dioxide into the 33" BFGs that the old girl sports. I also filled up Matt's tires and when all was ready, we carefully merged onto the highway and, once again, beat feet for the next campsite. We knew there was a swell in the water, we knew it was maxing out some spots so we decided to head to one of our favorite protected points. 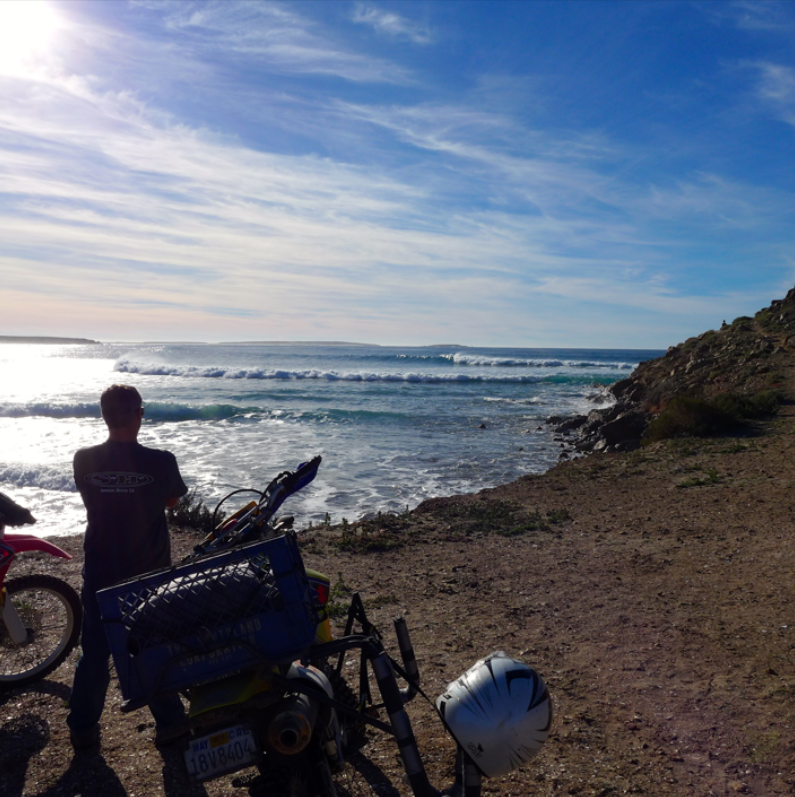 The spot offers both a great, secluded campsite and a nice little wave in the lee of a classic Baja point. 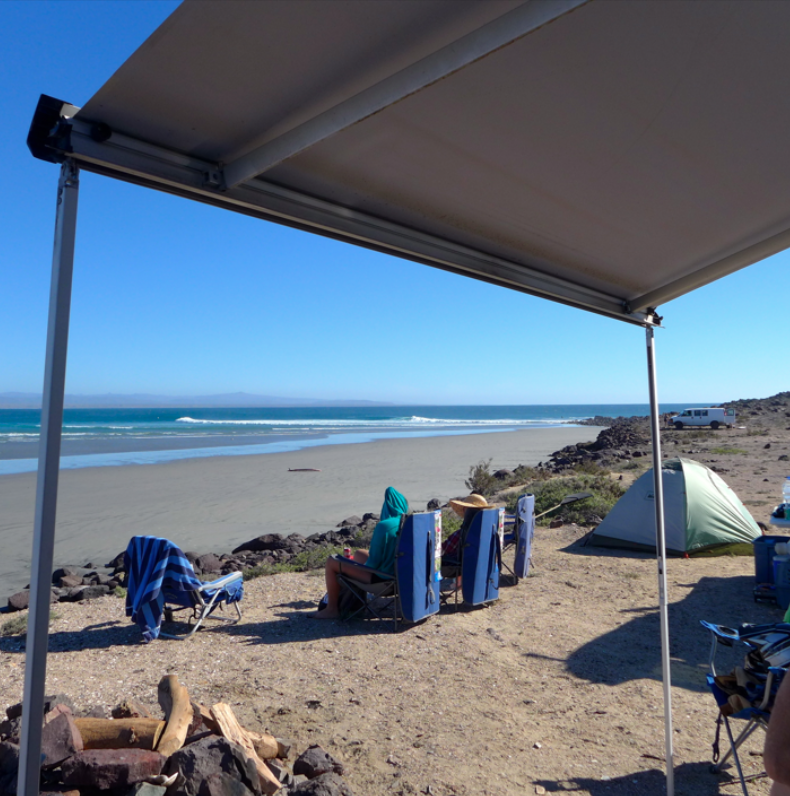 Our first surf campsite is one of my favorite spots in Baja, 4x4 is a necessity since to get to the campsite you need to drive the beach, power over a sand dune and descend a very rocky little hill. Here we are tucked into the lee of that little point and, yes, that's a really, really fun little bowling righthander in our faces. The campsite is up on a low bluff right in front of the wave. Getting down to the beach is easy and paddling out is even easier since the entry is completely sand- shuffle your feet because warm water and sand means stingrays. Check out the 4X4 AstroVan in the distance, cool rig- that's a guy who showed up with his wife, two year old and his dog on the last night we were there. Cool people and they brought firewood too! The motos were great to have at this spot. There were plenty of fun roads to zip around on and at low tide riding across the big, flat beach was a blast. There's also a small town nearby and we used my DRZ400 with rack to pick up 8 gallons of water, some cold beers and some ice cream- what more do you need? Another plus was using the bikes for surf exploration. 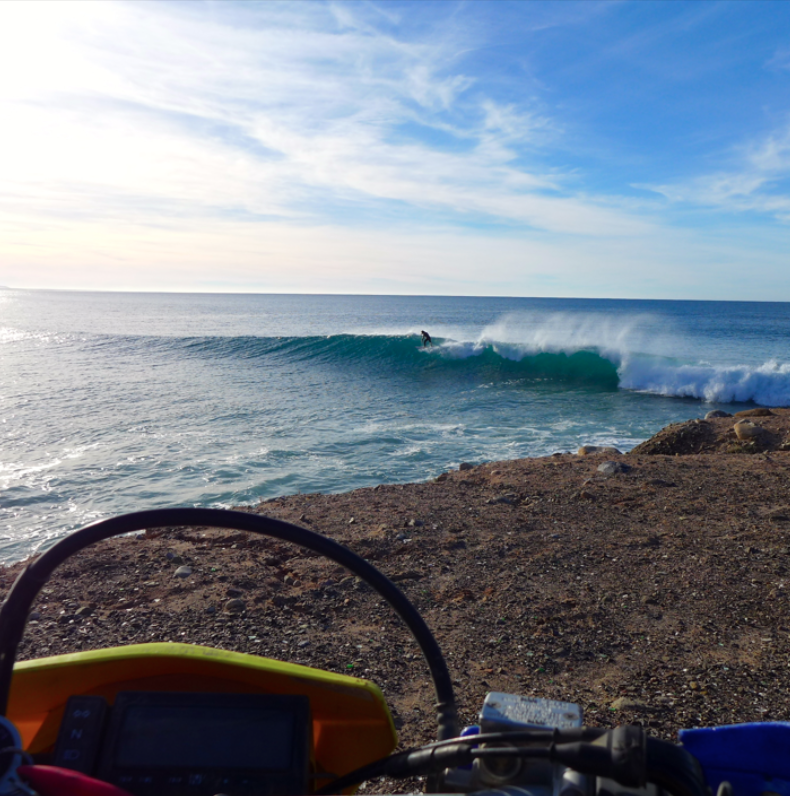 In that one little area, there were at least four really fun, point break waves within a 10 to 15 minute moto ride. It's definitely a wave rich region when there's swell in the water. Here's a fun right point that's ten minutes, by moto, from camp. There were two guys out the first time we looked at it and zero guys out the last time we checked in. 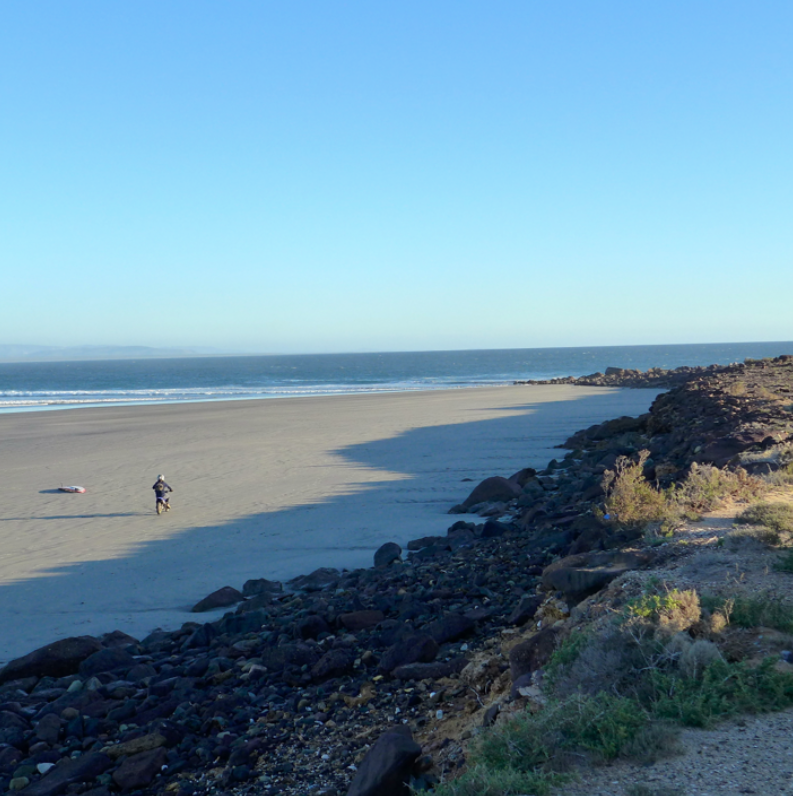 Here's another spot that's close by- looking fun at hightide, no takers. You will need a 4x4, high clearance vehicle- check out how sharp those rocks are- gnarly! And, hard to see, but on the left side of the road down, there's a pretty good drop off that you have to be careful to put your left wheels directly onto. If you mess up you could bottom out onto the rock and tear open the soft bits under your vehicle. CON KSO handled it but I have to say, it was a little tense coming up that with the moto trailer on the rig. Heading out and heading south. 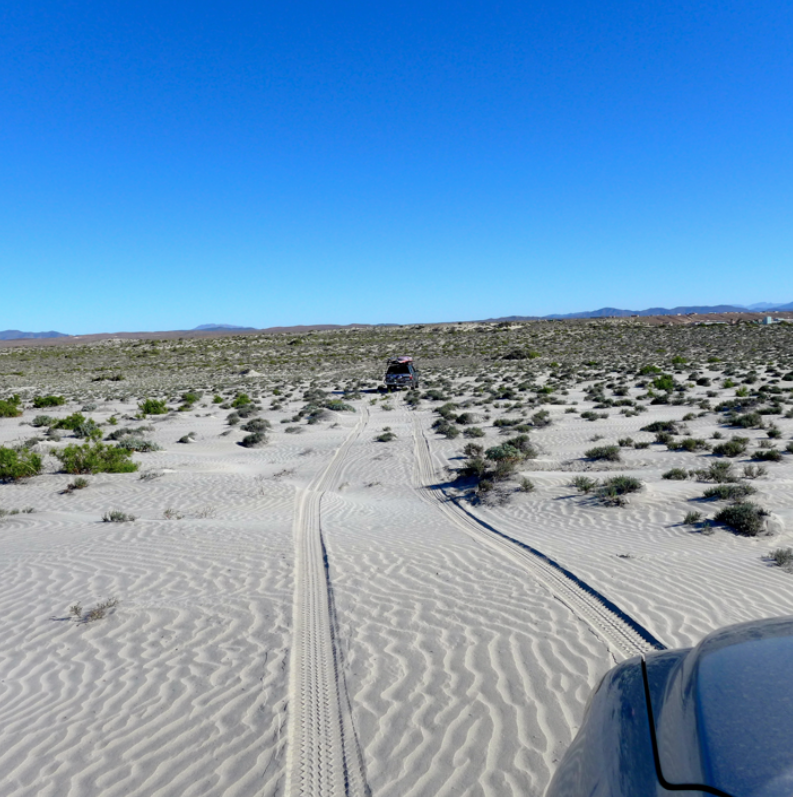 There is another way out that bypasses driving on the beach (at high tide, beach driving is impossible) but the sand is very soft so be prepared to air down and keep the vehicle rolling- throttle control is key. 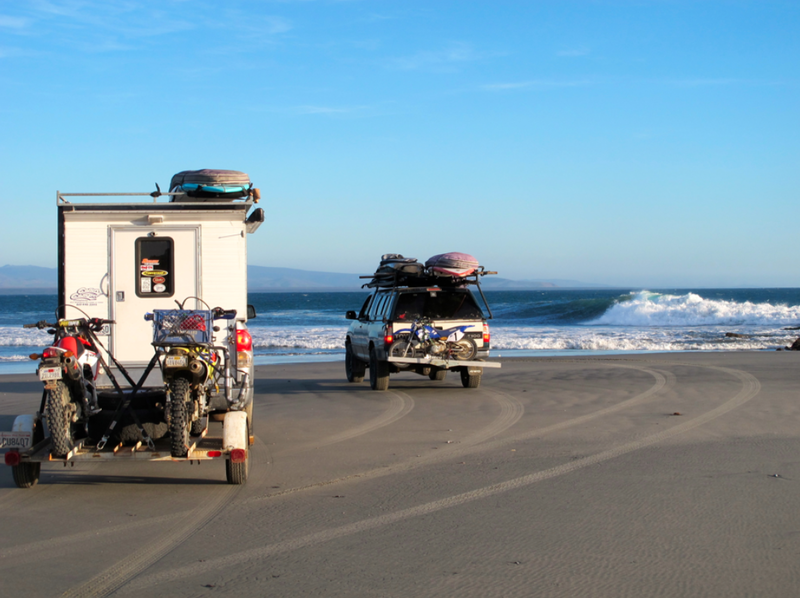 The surf was so consistent and fun that we ended up setting up camp for a couple of days. The water was warm, it must have been in the low seventies (I trunked it) and the surf, on the first day, was beefy. I followed Matt's lead and pulled out the big 12' stando (Boga, El Rey- perhaps one of the first ones) and paddled up to the rock that marks the take off spot. The wave at the point is practically tailor made for stando surfing. The take off requires a sprint effort to force yourself over the ledge right next to the marker rock. It's not a high-stakes takeoff but you have to be comfortable with putting yourself right next to something hard and barnacle covered, if you sat off the rock, you'd probably miss the wave since the wave's energy focused itself on that little patch of water. Once in, the wave stood up, on low tide a barrel is possible, and then uncoiled itself down the point. On a solid set wave, two or three off the bottom, off the top hits were possible (well as much of a "hit" as was possible with 12' of board under your feet). The juicy take off section then bent around with the point where the face was totally sheltered from the wind. The result was about two hundred yards of emerald green wall- not grinding and pitching but just a fun, walled up section that allowed a 12' board to gather itself up and run. If you haven't felt the free flight of 12' of rail you should dust off your old big boy of a board and give it a shot. Seared onto my hard drive is one particular wave where I wrapped two, four acre long, wrap around cutbacks (huge leg workout) that set me up for that jade green, chest high inside wall section. I remember just putting all that board into the perfect little hook point of the wave and then just standing there feeling the warm sun on my bare shoulders, watching the sand run underneath me and just gathering up all the happy data points that I could; what a wave, what day, what a place to be!